ISRO has announced that the ASTROSAT it has been building and assembling for a while now is ready for launch. The space & research organisation will be blasting off the astronomical observation satellite from PSLV-C30 on September 28th (Monday) at 10 am from Satish Dhawan Space Centre, SHAR. Along with Astrosat, ISRO is launching 6 other international satellites (4 from the US, 1 from Indonesia and 1 from Canada) as well. 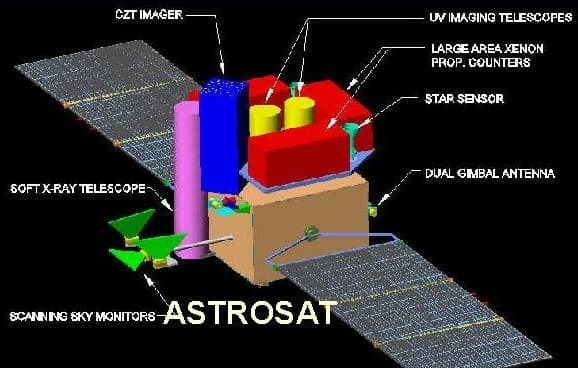 It is important to note here that Astrosat is India's first dedicated multi-wavelength space observation satellite. Some are even calling it India's Hubble - the US-European joint space observatory that has been successful in discovering new galaxies. ASTROSAT is the fourth such satellite in space after Hubble, Japan's Suzaku and Russia's Spektr R.
In May this year, ISRO had declared that ASTROSAT had been fully assembled and ready for launch. After launching on Sept 28th and reaching its destination, this astronomical satellite will conduct observations in the Ultraviolet (UV), optical, low and high energy X-ray wavebands simultaneously. Its orbit will be at 650 km altitude with orbital inclination of 8 degress circular near equatorial orbit. The diameter of Astrosat’s optical mirror is around 30 cm, compared with 2.4 m in the case of Hubble. ASTROSAT will make it possible to measure magnetic fields of neuron stars, understand high energy processes in binary & extragalactic systems and even search for black hole sources in the galaxy. ISRO scientists will use this purpose driven observatory to monitor the X-Ray sky for new transients, studies of the periodic and non-periodic variability of X-Ray sources, simultaneous multi-wavelength monitoring of intensity variations in a broad range of cosmic sources and for conducting sky surveys in hard X-ray and UV bands. The Astrosat will carry instruments of various Indian research labs such as the Tata Institute of Fundamental Research (TIFR), the Indian Institute of Astrophysics (IIA), the Inter-University Centre for Astronomy and Astrophysics and the Raman Research Institute (RRI). In addition, two payloads have sensors from the Canadian Space Agency and the University of Leicester, UK. What are your thoughts about India's first dedicated mission dedicated to astronomy and the study celestial objects? Share with us in comments below.